OSD Mute is a small application that can display Mute on message on your system the moment you mute the volume. OSD Mute is available for free and it can display an alert whenever the volume of you PC is turned mute. I tried it myself and used it as soon as I downloaded it. This tiny application does need some description to give you an idea. 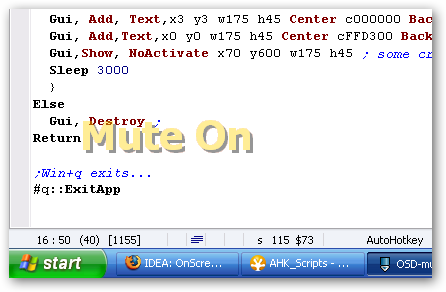 It is basically auto hot key based application which shows the mute message which appears as an semi transparent on the screen so it is not so annoying. There is also a standalone application. There are no more days of worrying yourself for simple things like wen there is no sound coming out of your system. You surprisingly find it that it is in mute mode after a series of restarts, changes and even feel as if there is problem with hardware. So this one is quite handy and simple to download and use. Obviously it takes up pretty much less space as it so small application. Available in two version full and lite with variation in capabilities. You can even start this app along with the system start up.